Sometimes, when you are interested in something a little off-center of mainstream culture, say like board games for instance, it can feel a little lonely. You spend times learning as much as you can about your exciting interest and find that when you get the nerve to share it with someone they aren’t as enthusiastic as you are. (For shame!) But then you find your tribe. The worlds gets smaller through the innovative technology and you begin to find pockets of your people spread across the world-wide-web. And occasionally you find out that some of these kindred spirits live in your own backyard. This is the case for me and my friend, Jason Slingerland. Jason is a cool dude who lives in Kalamazoo, Michigan. He’s into board games, too. He’s also into designing board games. He even has a cool podcast where he and another Michigander get together to talk about designing board games! As a person who is always on the lookout for opportunities to learn and grow from the experience of others’ I was able to ask Jason a few questions. We talked about his show, Building The Game, and a game he’s self-publishing with the help of Kickstarter called Water Balloon Washout. I hope you’ll take a few minutes to listen in on our conversation. He’s good people. Hi Jason, tell me a little bit about yourself. You have a new game up on Kickstarter that you are self-publishing and you are the co-host of a lovely podcast. Tell people about that! I’ve been playing games my whole life and in the last year and I half, I have really gotten into designing. Around that time I started doing a podcast with Rob Couch called Building the Game. On the show we discuss talk about what we have been playing, discuss mechanics and then we pitch new game ideas each week. The show started as a way to track our progress from being complete newbies at designing to hopefully experienced designers. We try on the podcast to really show the process of design from conception through publication. Some many people feel like game design is inaccessible when really it’s quite the opposite. There are so many people willing to help out new designers. My new card game, Water Balloon Washout is now on Kickstarter through August 11. It’s a light strategy game for 2-4 players that revolves around kids having a water balloon fight. It’s a simple that only takes a couple of minutes to learn to play but as you move through the game you find that there is a good level of strategy involved and also a lot of replayability. So I know in the beginning of the Building the Game Podcast you and Rob set out to document the process of becoming published game designers. How has the podcast been successful to those ends? We are making good progress towards that goal. I sold a card game design to Hat Trick Games last fall called Gunslingin’ Ramblers and it’s due out next year. That has really given Rob and I some insight into that process of working closely with a publisher. We are constantly getting great feedback from listeners that really encourages us. Our audience has been consistently growing and we really feel like we are making a difference and helping newer designers. In the process, it’s also been very helpful to Rob and I as designers. Now that you guys are starting to get your games out to the world, how will this change the content/concept of Building the Game? I think overall it doesn’t change up the show all that much. Maybe having games out there gives us a little more street cred but really we have had very experienced designers telling us from the beginning that our ideas were valid. I think that goes to show how open the community is to new people. I can say for sure that our format won’t change. Just our level of experience. Let’s talk a little bit about Water Balloon Washout. How did this game come to be? What made you decide to try this one out of all of your ideas to be the one to self-publish with the help of Kickstarter? This game came to be when I wanted to design a game that captured a neighborhood snowball fight in a way that felt like you were really in the thick of it but still have the game be very simple and easy to learn. Over time the game changed a bit and became Water Balloon Washout. The core was still the same but the theme changed from Winter to Summer. One of the side goals that came about from designing this game was that I realized I had created something that was simple enough kids could play but it had enough strategy baked in, that adults, specifically gamers would find it fun and replayable. This is something I am really proud of about the game because I think that’s a tough thing to do. Having playtested the game with kids and also adult gamers, I have found it equally enjoyable for them yet on very different levels. As for why I decided to self publish the game… I have always been interested in that model and this game being a 90 card deck in a tuck box seemed like a low risk way to test the waters. Also, it allowed for Rob and I to get that insider experience into publishing via Kickstarter. What have you learned so far through the process of building a Kickstarter campaign for your game? I knew there was a lot to be done but I figure I spent about 60 hours just working on my Kickstarter page and laying things out. I couldn’t believe it took that long. I have also learned that waiting for more backers to come on board can be nerve wracking! I really love getting to talk to other designer’s about the design process. Everybody seems to have their own system or approach. Tell me a little bit about yours. I am a very theme oriented person, so I generally find myself coming up with a theme and then trying to find mechanics that really mesh well with that theme. I usually take copious notes in an Excel spreadsheet trying to balance the game before making a prototype. Once I make a prototype I have a core group of people that I test with. You live in my home state, the lovely mitten; Michigan! What is your favorite game shop or gaming event in Michigan? Game shop is definitely Fanfare in Kalamazoo where I live. As for favorite gaming event, I would be after this year it will be GrandCon. How about a little more in general; what is your favorite thing about living in Michigan? Michigan is a beautiful state with 4 full seasons and so many different landscapes to see. I love camping and nature so this is a good place for it. Thanks so much for taking the time to answer a few questions. I wish you much success with your Kickstarter campaign, the podcast, and your upcoming game Gunslingin’ Ramblers. Is there anything else you’d like to mention before we wrap this up? Thanks so much man! This was fun! You can back Water Balloon Washout on Kickstarter right here! I have never been to Hawaii, but if it’s anything like the post-apocalyptic vision from Crash Games’ upcoming title, Paradise Fallen, I think I’d rather stay away. The beauty of the islands call out to me but the lack of supplies, savage tribes, and disruptions in the natural order of time and space doesn’t make for the type of quaint vacation spot I’d hope for. While I’d be too much of a sissy to visit this fallen version of paradise for a little fun-in-the-sun, it does make a great theme for a board game! And a good one at that! Box art mock-up for Paradise Fallen. Now on Kickstarter! In Paradise Fallen, from Crash Games and first-time designer, Andrew Wright (II), players assume the role of tribesmen seeking to explore 9 islands in search of the mystical powers they provide in a not-too-distant-or-friendly-future. Think Lost meets The Hunger Games meets Indiana Jones…kinda. Game set-up is a cinch. Shuffle the 9 island cards and place them in a 3 x 3 grid in the center of the table. Shuffle a deck of cards and deal 5 to each player. Place your player piece on the corner island closest to your seat. Dump the Kanaloa Tokens near the board. That’s it! You are ready to explore. Learning how the game works is almost as simple as the set-up. On a player’s turn they can move around the islands and play cards from their hand as much as they want as cards allow. To move to an adjacent island you must play Ration Cards (Island Cards may also be used for 1 ration) that are equal to or greater than the cost specified on the island you wish to enter. Any rations above the specified amount are lost so it is necessary to plan your movement carefully and efficiently. Discover an Island: A player can Discover an Island they are stopped on by playing an Island Card with a matching name, placing the card in front of them and placing a Kanaloa Token on the card that can be used one time to activate that island’s special ability. You can only spend one Kanaloa Token per turn but they can be very helpful if you time it right. Aptitude Cards: Aptitude Cards are special action cards that breaks some of the basic rules and can be played to either help you help yourself or hinder your opponents. Each card is used once and discarded when you play it. Aberration Cards: Aberration Cards are played on the island grid either on an island or in-between islands and can also help you or hinder your opponents. They can even hinder your own plans since the effects are applied to the player who placed them as well. So be thoughtful about where you decide to play these cards. Aberrations are cumulative so the more cards placed on a location the more the effect are amplified. 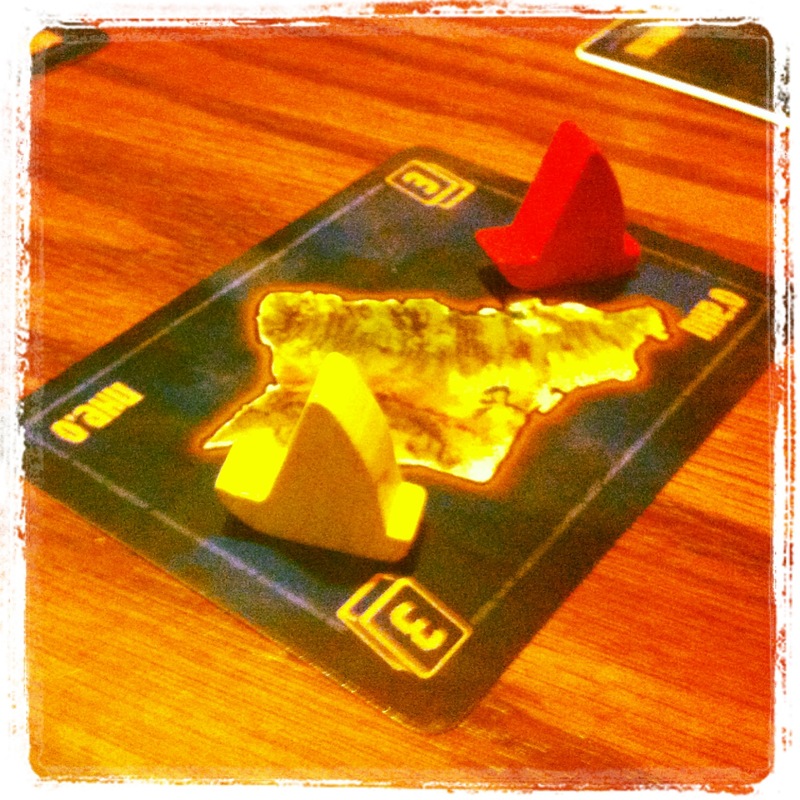 Play continues until one player discovers a certain amount of islands. The number of islands is determined by the number of players in the game. Once someone discover the set amount of islands all other players get one more turn. The player who discovered the most islands wins. Ties are broken based on who has the most unused Kanaloa Tokens. Sounds pretty simple, eh? But don’t let this simplicity of set-up and game-play fool you. There is a lot of game here. 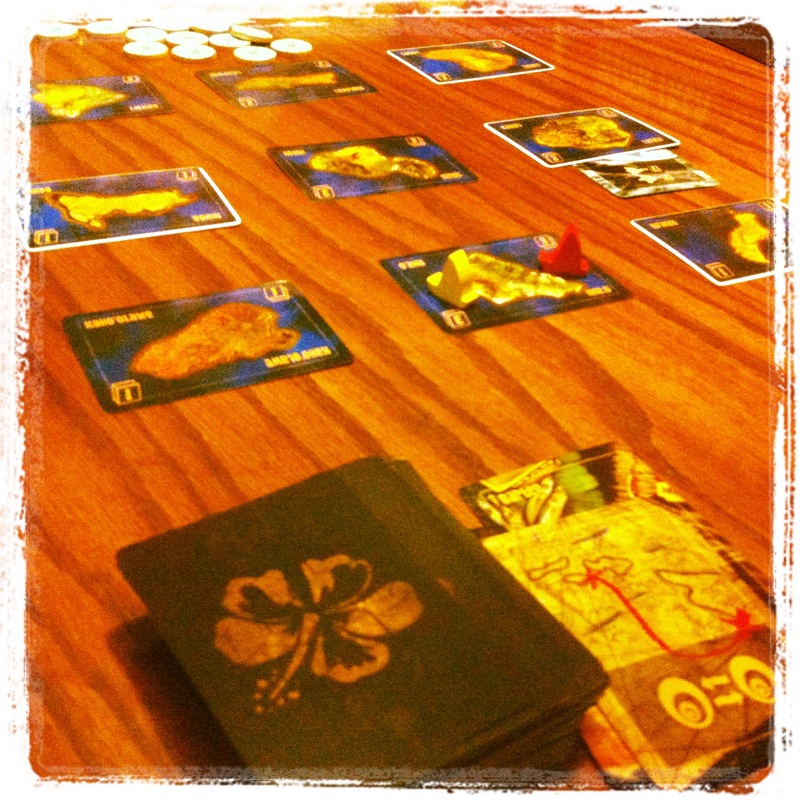 At it’s core the game is a medium-weight, hand-management game that involves luck, tactics, and strategy. At times the game feels very puzzle-y as players will have to figure out how to use their cards to optimize movement and make the most of the rations available. All of this works very well in a 30 minute time frame where the experience feels different with each game. My wife has this rule about the time of day that is acceptable for learning new games. On weeknights, if the sun looks like it’s thinking about going down in the next hour or two, she doesn’t want anything to do with anything new. But when I suggested giving Paradise Fallen a try a little after dark this week, she accepted my invitation when I told her it would only take a minute to learn the basics and be done in thirty minutes. After cruising through our first play she told me she really liked the game and was looking forward to playing it again. That is considered a huge win for me! I’ve also got a soft spot for small games that pack a big punch. So much so that this was one of the design goals for my own game, The Great Heartland Hauling Co. I’d happily place Paradise Fallen in this category of games. Using a few simple components and a deck of cards, Crash Games and Wright have delivered a portable game that can be learned and played quickly. I can definitely see myself taking this game along when I am taking off for vacations to much less fallen paradises than the one explored in the game. And what about the art and design? This game is gorgeous! Artist, Jason Carr, and designer, Darrell Louder (of Compounded fame!) have created a visual experience that captures the beauty of the islands with the chaos of the theme in a very functional way. This thing looks HOTT! The iconography depicted on the cards to illustrate special abilities allows the art to shine without being covered by an excess of words. The icons work but will probably take a couple plays to get all the details stuck in your head but once it clicks, it really clicks. Paradise Fallen is a fun, quick game with an interesting, unique theme. It’s on Kickstarter, so get on board now. Just remember to be on the lookout for rogue tribes trying to get in the way of you harnessing the power of this fallen paradise…or something like that. Just do it. It’ll be fun. A prototype of Paradise Fallen was provided for the purpose of this preview. I’m also friends with Patrick Nickell (owner of Crash Games) but I would tell you if this game sucked, which it doesn’t, so there. Well, folks, Heartland is hauling. My first tabletop game design ever has been released to the public! What a cool milestone for me. A few years ago, I never would have imagined that I’d be a published game designer but if I’ve learned anything over the years it is that things don’t always goes as planned and there are still good surprises in the world! I even spotted the game on the shelf of my local game store. It’s pretty neat. I am so glad that people are liking the game. 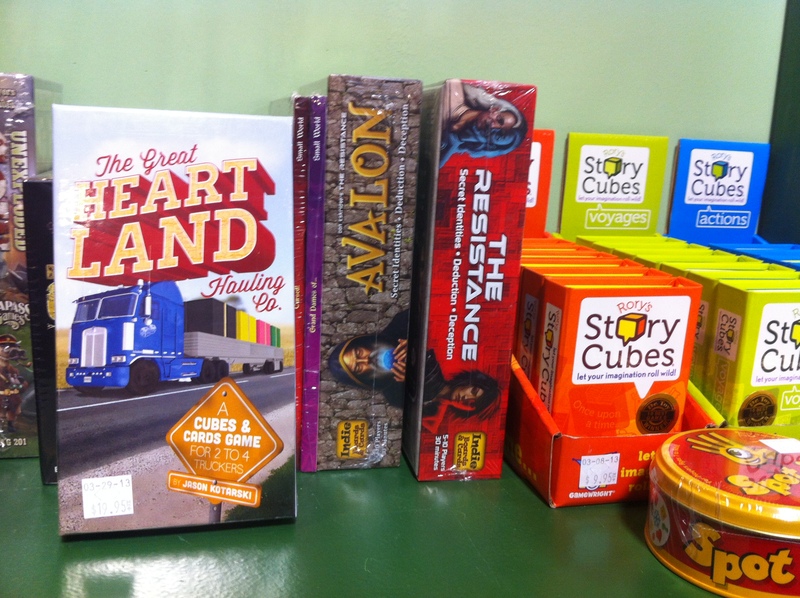 The Great Heartland Hauling Co. on the shelf at Gamer’s Sanctuary in Flint. There is this funny thing that happens when you are a creative type. When you are working on something that you feel is important, great stuff, you start to think about what’s next and wrestling with identity questions like “did I get lucky or am I good enough to do it again?” At least that’s how it works for me. I try not to get too stuck looking too far out in front of me but when things get rolling it feels important to keep building on the momentum that is already working for you. And when things get buzzing, I find that they’ll keep buzzing if I can keep up. I guess that’s what Jim Collin’s Flywheel Principle is all about, but I digress. The difficulty for me is that one idea leads to another and then I have to decide which idea to pursue. Sometimes this is an easy decision but not always. And that’s the tough part, sometimes being creative feels like work and other times the muse drops an idea into your lap. And sometimes the best stuff comes from the stuff that feels like work while other times the stuff that just happens is the best stuff. It’s important for me to remember this when I get lazy. It’s then when I need to open up a blank Word document and just start typing until the page is filled. It’s then when I need to pick up a deck of cards and start shuffling and dealing and making pretty shapes until something clicks. And when the works feels grinding, I need to remember, too. I need to remember to step back and take a break because sometimes things come together when you aren’t even working on them directly. The tension is to remember and live in-between both places. And I’m just talking about the creative part of designing games, or any other creative pursuit, here. This doesn’t take in to account the work involved in getting a game published, the business of the work. In between great ideas you have to learn to get a sense for when something is ready and then figure out how to pitch the idea and who to pitch it to. Or you have to decide if you want to produce it yourself. This is fun and creative in it’s own way, but it calls for a willingness to do your homework and listen, and I mean really listen. When people don’t like something about your game, or song, or story, or painting this can feel very personal like someone is saying your baby is ugly but if you are willing to listen you can learn, even if you disagree. Maybe this sounds a little bit like chaos to you. But to me, it’s a very exciting process that gets me pumped up. I feel alive when I am bringing creative pursuits to life. Even when it hurts because it’s hard and frustrating, it still makes me feel alive, pain is like that sometimes. It jars us awake and aware and makes us present to the moment. When I remember thing part about the creative process being the thing that makes me feel alive, I can settle in and do the work I love to do because I’m free from having to worry about the final product. I no longer have to ask those questions about whether or not I’ll be a one-hit-wonder because getting published is just a perk that sometimes follows doing what you love. These days I’m not so worried about whether or not I’ll have new ideas that are worth publishing, I am just focusing on the process and trying to enjoy each step along the way. And in the midst of that, some stuff will get published and some won’t but either way, I’m still having fun doing something that feels important and has potential to bring people together. For me, that is what makes this important work. Time to get back to it. So it’s been awhile since I’ve posted anything here on The Green Couch. And I think a light bulb just went off that helps me understand why. Ready? I know, I am writing now. There was once a blank space here and now there are words but when I say “I am not a writer” what I mean is that I don’t get this urge deep down to puts things down on paper or save them to my hard disk. I can write. And a lot of the things I do involve writing. As a pastor, I craft 3000 word messages week after week to share with my community. As a musician, I jot down lyrics that explain an emotion or idea that I want to share in a song. As a game designer, I have to write clear instruction so people I don’t know can figure out how to play my games. So, I write but I am not a writer. It’s not in my blood in the same way as real writers. You know the kind I am talking about. The ones who would be happy to spend much of their lives in a small, quiet office massaging the keyboard in a way that every word becomes a part of a sentence that forms a paragraph that makes you gasp for air because of the beauty and truth in what is being shared. Yeah, that’s not me. That’s someone else. Don’t think I am being overly hard on myself. I am okay with this discovery. I am not a writer. I write. And I can even write well if I put my mind to it. There have been many times when I wanted to see myself as a writer because writers are important. And who doesn’t want to feel important? I’ve noticed that the times I do write are always connected with doing something that connects me to the people around me. I write a sermon each week to connect with the people of much church. I hope that what I share adds value to their everyday lives and, in the long run, to our community. We have to do something when we get together, right? I write songs to help me communicate things that are hard to communicate. But I also write songs because I get to record them or play them in front of people. Music is about creating an experience. And that weird board game thing I’m into? Well, that’s about creating an experience, too; bringing people together in a real life situation, face to face, using their brains, having fun, and making memories. I don’t write just to write. I write when it leads to bringing something new into the world. I write when I see an opportunity to connect. I write so I can do. I’m not a writer. And that’s okay. I’ll keep writing because it’s what gets me to the life I want, to the life I feel called to. I’ll keep writing because if I don’t there will be many things I want to see in the world that never come to be. Writing is a tool. Writing is a gift. I am not a writer. Or at least that’s what I tell myself when I don’t feel like writing. Last night at Dwellings, the new church that I’m a part of, we hosted the first of three movie screenings in a film series called Contineo. Contineo is a Latin word meaning “to connect or join together”. The heart of the Contineo Film Series is to connect people together through discussions on faith, art, and community as we explore some interesting movies together. As I sat in the Flint Local 432 watching the first film in the series, Danielson: A Family Movie (or Make a Joyful Noise Here), I was reminded of the place that this idea was born. In 2006, my wife and I made our second trip to the Cornerstone Festival in Bushnell, IL. The festival was an experiment that began in 1984 by a group of Christian/hippy/rockers from a commune in Chicago called Jesus People USA. Cornerstone was created to provide a space for Christian music that fell outside of the mainstream by gathering annually to celebrate the diversity of God’s people. Over the years, Cornerstone added different elements to the festival experience including a film festival called Flickerings. During our first trip to Cornerstone in 2004, I was so excited to see every band possible that we ran around like crazy people. While it was a memorable experience, it was exhausting! So when we went back to Cornerstone two years later, we realized that we wanted to have a more restful experience. It was out of this desire for restfulness and a slower pace that we stumbled on Flickerings. On the second day of the fest we crawled out of our hot, sticky tent and made our way to see a documentary about a quirky musician from New Jersey named Daniel Smith. That morning I was struck by the beauty, creativity, and honestly that the filmmaker, JL Aronson, was able to capture. I remember being inspired to think of Christianity in new ways. I saw Daniel living out an authentic faith apart from the Christian subculture that so often seems to seek to shelter and protect people from the world around them. Daniel seemed driven to create art from who he was and share it with anyone who would listen. He was true to himself even though the sounds he creates aren’t always the most pleasant for casual listening. As a new Christian, the experience of Cornerstone and watching Danielson: A Family Movie were formational events for me. I began to dream about how I could live my life with the kind of integrity displayed by Daniel. I wondered how I could live my faith in a way that didn’t scare away those who had different ideas and desires than I did. I wondered how art could be used to build relationships and nurture productive conversations. So six years later, these are still the kinds of questions I wrestle with. And I think with every new day and each step I take I’m moving towards the kind of life I started dreaming about down in Bushnell, Il. Now, that Cornerstone has called it a day (the final Cornerstone Festival took place in July of 2012), I hope that Dwellings will help to create that kind of safe space for people to question and connect with God that Cornerstone, and artists like Daniel Smith, have provided for me, at least did in my little corner of the world. I’d love to hear from you! What are some experiences or pieces of art that have moved your towards the kind of life you want to live? If you are interested joining us for the next installment of Contineo, can get more info here. The one word that keeps coming to mind when I think about how our first service went is comfortable. From set up to tear down everything felt very natural. I didn’t feel the need to make anything happen. It didn’t seem hard. There was an excitement in the air because new things are, well, exciting, but I think comfortable sums it up nicely. When we showed up at 8a.m. in the morning to get everything set up everyone who was there chipped in without a ton of direction and just did what needed to be done. With the help of the Flint Local 432’s regular sound guy, Tim, the band got set up and was ready to go within 20 minutes. We decided last minute to project the words of the songs we were singing for worship (and the PowerPoint that went along with the sermon) on the wall to the left of the stage instead of on the giant screen that would have came down in front of the stage and obscured the players from the shoulders up. It was a last minute decision that didn’t occur to us at rehearsal a couple days earlier but when we showed up in the morning it was pretty obvious that it would be a great solution. I think the result was fantastic. First, it allowed the musicians who wanted to stand to stand without worrying about being cut in half by the screen. Secondly, and I think most importantly, the screen being off to the side changed the focal point of the people in the congregation. Folks looked toward the screen and I think it made it easier to focus on the words in order to collect ourselves in worship. After we set up the band, we quickly put the chairs and tables in place and did a run through of the set list for the service. This gave our tech person, Sarah, a chance to run the the powerpoint and get her familiar with the songs. After the band wrapped up, another crew of people showed up to get the coffee brewing, set up the kids area, and pass out donuts to the bikers who were in town for the big Bikes on the Bricks festival Downtown. We bought a fancy new airpot brewer to make our coffee so Jay and I had to spend some time making sure we knew how to work it and where we were going to store it but we managed to get some decent coffee made to offer our people. We have decided to use ceramic mugs and have someone take them home each week to run them through the dishwasher in order to cut down on waste. Lisa and I went to the Salvation Army last week and picked out a bunch of the most random mugs we could find. The mugs were a nice conversation piece for the morning. We joked that instead of having people who come and sit in the same pew week after week we’ll have people that live and die by the coffee mug that they drink from. We’re also working with a local coffee roaster who will be roasting fresh coffee beans for us each week so we will be supporting a local business and have great coffee to share with our people. Since the space we are meeting in is essential one big room with a couple restrooms attached we are trying to figure out ways to have kids stay with us in the service that allows the adults to focus and participate in the service without having to worry about their children being a disruption. We decided to set up a table and some floor mats up off to one side of the room to give kids an area where they can draw, play with playdough, or do puzzles. A couple parents and Casey, one of our college student, sat down on the mats to play with the kids throughout the service. A few of the bigger kids passed headphones back and forth while watching a movie on a computer. The kids seemed to really enjoy the atmosphere and made themselves quite at home. During the service, the kids were amazing. For nearly and hour and a half they hung out with us doing their thing. Hopefully they will enjoy themselves as much next week as we continue to explore different ways to engage them in what we are doing as a church. We’re thinking about getting a bunch of tambourines and shakers so they can dance and jam with us during musical worship. Lisa and I saw this done at TheStory in Sarnia and it was awesome to see the kids involved in worship. Besides we don’t currently have a percussionist, so what the heck, right? Since the big Bikes on the Bricks thing was going on Downtown we decided to find away to engage in what was already happening around us. So we ordered 8 dozen donuts from Donna’s Donuts and gave them away to bikers who were setting up for the day. We didn’t do this as a way to have an opportunity to invite them to church but just to tell them thanks for coming to the city. This seemed very organic. As soon as the donuts showed up, a bunch of our people paired up, grabbed some of the kids and went walking around on Saginaw Street passing out donuts. I think everybody had fun and it was a simple way to connect with our neighbors for the day. By 10:20a.m. the rest of the folks who were joining us for the service had arrived. People mingled, drinking coffee and chatting until we got started at 10:30. The service was pretty simple. We started with a song and welcomed people to make themselves comfortable while we sang songs together in order to engage in the same activity together as a community and to quiet our hearts to focus on whatever God might have for us. We sang a couple more songs and Carrie came up to read from the Psalms. We played one more song and then Jay gave some brief announcements before moving into the sermon. We decided that we wanted to invite people to be an active part of the service by asking some questions and giving some time to reflect by writing in community journals. I asked some simple, straightforward questions throughout the service to give the congregation an opportunity to share ideas out loud as we talked about the idea of “following”. We talked about the different ways of coming to know someone or something, different kinds of things people follow in our culture, and what is required of those who want to follow someone or something. People who wished to share simply chimed in with answers. I think this questioning seemed to help people stay engaged in the message. Then, toward the end of the message, I introduced the idea of the community journals. We bought some simple composition notebooks and pens and passed them out to people around the room. I explained that the idea behind the journals was to give people a way to process and wrestle with what we were talking about in a quiet reflective way. I instructed them to keep their entries anonymous and asked them to leave the books at church so they can grow with the community. Sometimes I’ll give specific prompts for people to respond to during our services but other times I won’t mention them at all. But the plan is to make them available week to week to be used however they help the church process; taking notes, writing prayers, drawing pictures, doodling, asking questions, etc. I gave a few prompts and gave folks a 5-7 minutes of quiet to jot down some thoughts. After the journaling, I gave a few closing remarks and closed the service with a video. After the benediction people sprung into action helping us get the space back into shape for the next punk rock show. Tear down was swift and organized. I think having been a part of the set up and tear down crew at Wildwind, our mother church, for so many years really helped the process to go smoothly. The buzz in the air was thick, at least it was for me. I know that I’ve given a brief record of concrete details here and while that might give people an idea of what we did, it doesn’t really contain the feeling of the experience. It was a great morning. The people that were with us (which included our initial core team, some friends from Wildwind, and a handful of people who wanted to see what we were all about before deciding how/if they wanted to be involved in a more direct way) seemed to be engaged and I’ve since received a lot of positive feed back in the last 36 hours. Several new people informed me that they would be back! Another person wrote and thanked me for making the experience comfortable for introverts and extroverts alike. And yet another person made a point to tell me how refreshing the service was and how the content has already provided them with opportunities to share some of the ideas they heard at Dwellings with people at their workplace. Good stuff is happening here. Stuff I couldn’t have planned. We’re just gonna show up and see what happens next, listen for what God is up to in our midst, and then show up again the next week…and the week after that…and the week after that. So good? Maybe you can join us sometime. Thanks for sharing in our story. Blessings. LINK ROUND UP #2: HEARTLAND HAULING HIT THE GOAL!!! Last night,my game The Great Heartland Hauling Co. reached the goal of $10,000.00 in pledges! Thanks so much for all of your support. You guys are seriously helping make my dream of being a published games designer come true! Even thought the game has reached its initial goal there is still lots of ground to cover. As of today, there are still 27 days left in the project. This means that for the next month people can still make pledges to preorder their game on Kickstarter. Each pledge made from this point will just keep pushing us beyond the initial goal. The more we push past this goal, the more buzz we’ll have surrounding the game which is a great thing for me as a designer and for Dice Hate Me Games as a publisher. But its not just good for us, its going to be good for you, too! At certain thresholds as we push past out $10,000.00 goal there will be new bonus rewards available to you fine folks as a thank you for helping us to get the word out about Heartland Hauling. The first “stretch goal” threshold is at $15,000.00 where everyone who pledged enough to get a copy of the game will also get a copy of the Truck Stop “Inspansion”. What’s an “Inspansion” you ask? Well, it’s a game expansion that comes in every box of the game to add more challenges and variety to the game! We’ll be rolling out more details about the Trucks Stops soon but just know that its going to be sweet! There are also some more surprises in store for all of our backers as long as we keep trucking down the road! Interview on Funding The Dream on Kickstarter Podcast with Richard Bliss. Richard is in his fourth season of covering the board games space and Kickstarter in short 20 minutes bursts of interviews with designers, publishers, and other industry folks. In my interview we talked about the process of moving from being an average joe to becoming a published game designer. Richard is a great guy so I highly recommend you check out his show! Game Designer Interview with Bellwether Games. Bellwether Games is a small publisher that features various game designer interview on their blog. Make sure to take a look at what are up to which includes their award winning card game Drop Site. A Geek-Craft Review of The Great Heartland Hauling Co. Ken Grazier played a copy of the Heartland Hauling prototype at the World BoardGaming Championship in Lancaster, PA and shares a glowing review on his blog! A Cartrunk Entertainment Preview. John Moller shares his initial impression from World BoardGaming Championships as well. Don’t forget the Kickstarter page! Keep your eyes on this page for more info regarding stretch goals and continued progress! And, last but not least, here’s a link to my first link round up. Thanks again for getting The Great Heartland Hauling Co. on the road! I'm a husband, father and pastor from Flint, Michigan. Creativity and collaboration have been huge parts of my journey. Jesus, music, books, film, relationships, games, and nature fuel my passion to live a life that matters.